On Friday, mom and I enjoyed dinner at Ole Tapas. I love international cuisine and I studied abroad in Spain 10 years ago, so when I heard that Ole won "Best New Restaurant" in Delaware Today, I knew I had to go. I'll write more about Ole another day, but I will share one bit of the experience. The food was excellent. The drinks were disappointing. I enjoyed authentic Spanish sangria during my trip to Spain, but I feel that the $7 I spent for a weak 6 oz. drink full of ice was just not working for me. When I came home I decided to make a batch of my sangria. I have a popular red sangria recipe, but I was inspired to try a white variety after tasting my friend Karen's wonderful sangria that she so generously brings to my home every time we have a party. 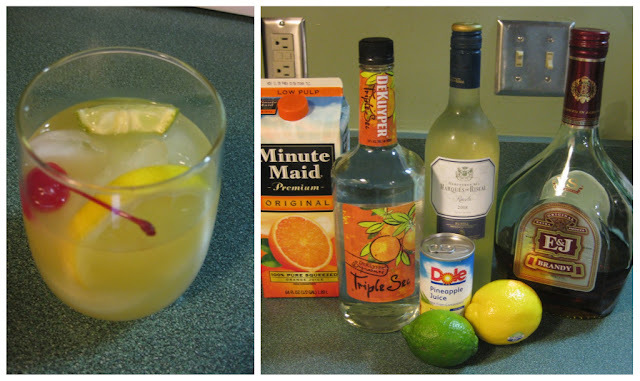 My version of white sangria is very citrusy and a bit tart. If you prefer a sweeter variety, you could add 1/2 c. sugar or top the drink with Sprite before serving. I like mine straight up over ice. 1. Mix all ingredients (except maraschino cherries) in a 2 quart pitcher. Place in refrigerator for at least 24 hours before serving. 2. Serve over ice topped with maraschino cherries and citrus fruit for garnish. I purchase pineapple juice in 8 oz. cans (normally sold in packs of 8). It costs a bit more than the large cans, but I don't normally drink pineapple juice and I hate having to store excess juice in my fridge. With the small cans I always know that I have pineapple juice on hand for mixed drinks. This recipe calls for a small quantity of frozen lemonade concentrate. I store the remaining concentrate in a small, resealable container in the freezer. It never freezes hard, so I just scoop it out as I need it for future batches of sangria. This recipe gets better as it sits. Please let it sit for at least 24 hours before serving. This is a strong drink. It goes down like citrus punch, but if you're not careful, it could take you out.